November 11 is Veterans Day, a day where U.S. citizens pay respect to veterans both current and past who have represented their country in war. In a post written by Larry Myers, T-Mobile’s EVP and Chief People Officer, the company we know and love has paid tribute and highlighted its ongoing support for former military workers. 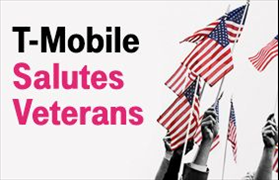 Ending off the post with a simple but sincere thanks to veterans and their families, It’s a nice touch from T-Mobile on Veteran’s Day. Our own thoughts join up with those from T-Mobile HQ, especially with our readers who are either in the military, or have family members or close friends currently serving. Thanks Cam, very well said. Much appreciated from Delaware, USA. As a Vet who is a son and father of Vets I appreciate this very much.